When I visited Tulum with my family for my mom's birthday last year, the entire time I couldn't stop thinking of how much my husband would have loved it. Since he couldn't join me last time, we decided to take a few days off and book a flight to Cancun. This was a totally spur-of-the-moment trip, so we ended up using up our points on our travel credit card (we have Chase Sapphire Preferred) to pay for our flights (we ended up using United Airlines) and car rental with AVIS. The flight to Cancun was around six hours in total from California and the drive was about an hour and a half from the airport to Tulum. It was a little cloudy when we landed, but the weather was a refreshing change from the gloomy weather we were experiencing back home. The mosquitos were already biting and the humidity was hot as hell, but once we got to our Airbnb, we forgot all about the cons and starting focusing on all the pros to being in paradise. When I was in Tulum last year, the Superhost of this INSANELY gorgeous house in the jungle - Quentin - reached out to me for a collaboration. We weren’t able to work anything out at the time, so when I knew I was coming back to Tulum, I decided to contact him since he's pretty much the most down-to-earth guy ever and we ended up staying in his palapa for two nights. Before I get into the details, let me just say that Quentin’s place is AMAZING. He told us that his property was in the middle of the jungle, and he was not kidding. It was a bit of a drive through a dirt road (feeling lucky that we opted for fully-covered insurance on our rental) and the foliage was so thick you could hardly see the sky, but it was totally worth it once we were parked and settled in. 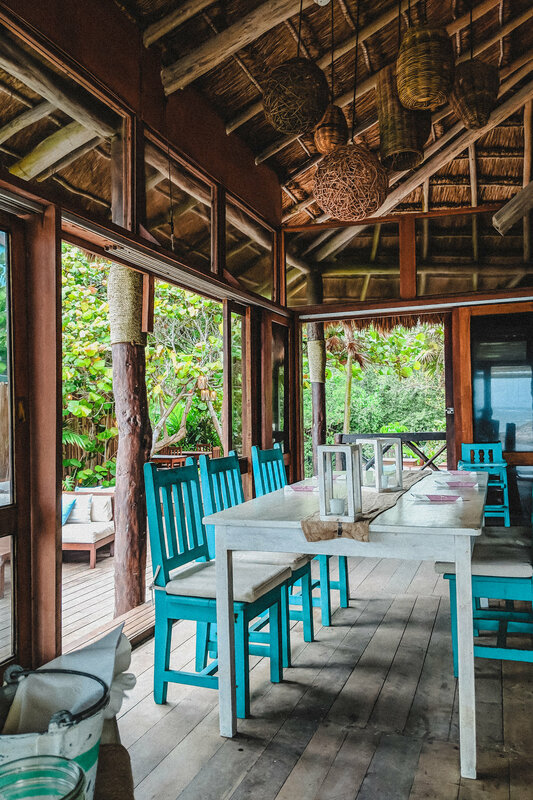 This palapa accommodates four people with a bunk bed on the ground and a double bed up the stairs (loft style set-up), comes with Wi-Fi, a private bathroom, and a shared kitchen. I could go on and on about amenities, but what makes this place truly special is its location. 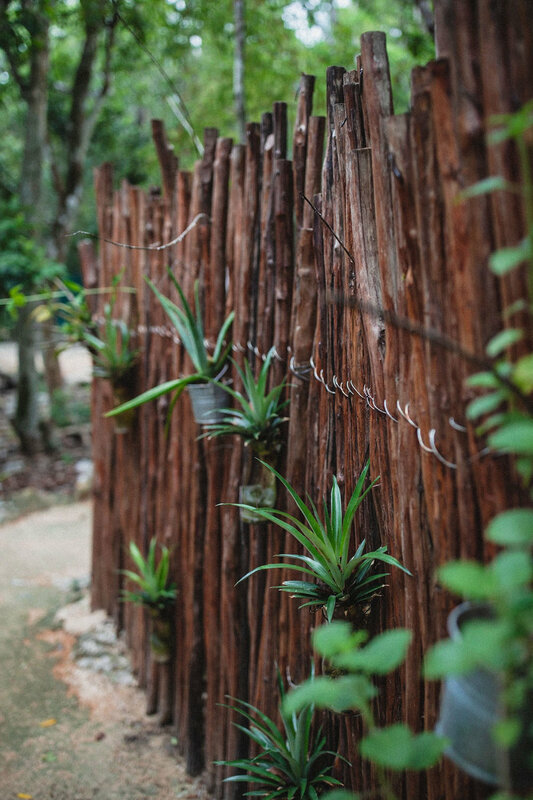 Waking up every morning to the sounds of the jungle was a pretty profound experience and I absolutely loved that Quentin made a healthy breakfast for us filled with fruits and vegetables grown around us. Admittedly, the majority of our first two days were spent just staying in together and we enjoyed every minute of it. Raleigh and I used this trip to reconnect to one another. Since we work together every single day, it can take its toll on our relationship in the sense that we focus too much on work and forget that we are first and foremost, a married couple. We talked a lot, laughed about things while swinging in the countless hammocks and swings built into every corner of Tulum, and (since the seaweed was really heavy at the beach) we made our way to visit a few cenotes. In case you don't know what a cenote is, it's a natural sinkhole usually surrounded by bedrock and filled with water so clear you can usually see all the way to the bottom if the light hits the water just right. We visited just a few and the two I think worth mentioning are Escondido Cenote and Cenote Calavera. The water at both of these places was super clear and the surrounding jungle is absolutely beautiful, but what I loved the most about both of these places was how private they were. A lot of cenotes can get pretty busy the more touristy they are, and while there were people around at the time, neither of them were overrun by tourists. 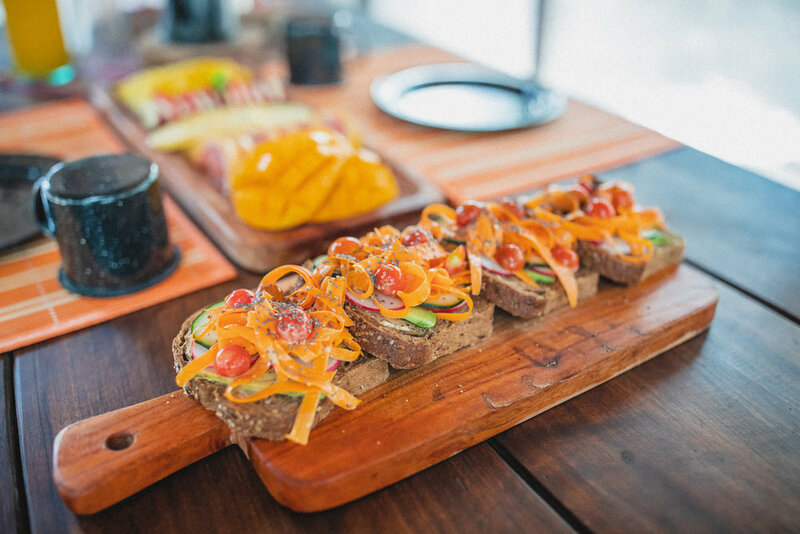 When we weren't lazying it up at our palapa or at a cenote, we decided to splurge a little and try out some of the restaurants on the beach. My thoughts: Pricy, but totally worth it. View: Surrounded by the jungle on the main road along Tulum beach - faces the road. Thoughts: Small, cute for pics, but overhyped on Instagram when it comes to taste. Food: Healthy, fresh & photogenic, but I found the taste a little lacking (needed salt). Kombucha was good! Decor: Very pretty, but uncomfortable. All the tables and chairs are kind of an odd height and shape since they're made from tree stumps. Ambience: Casual jungle explorer with a love for vegan food. Thoughts: Loved the feel of this place, but I think I ordered the wrong thing - would try again! View: Mostly of the decor - beautifully decorated! Thoughts: The decor was definitely the best part of this place - would love to try the breakfast. 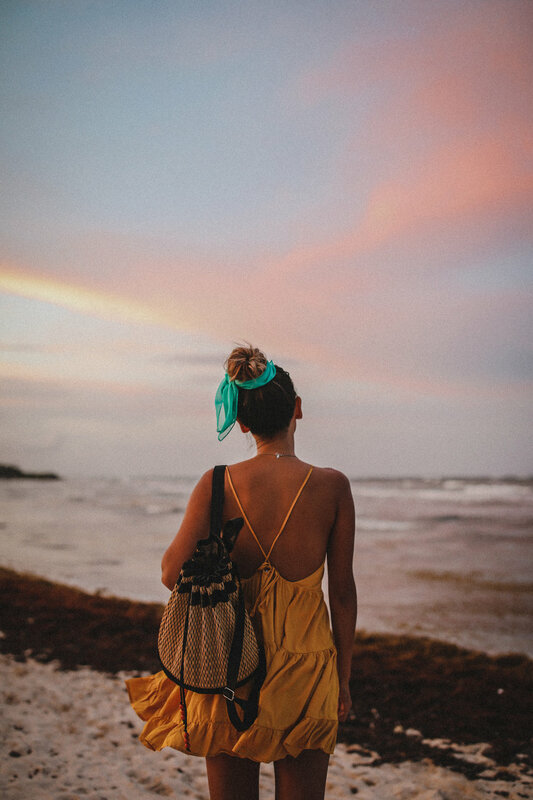 On a whim, I ended up finding a deal for a beachfront room at Papaya Playa Project on Booking.com (my go-to app for hotels when I'm traveling). I believe they're most known for their private pools on top of some of their rooms, but Raleigh and I just wanted something right on the water where we could relax and enjoy the ocean view. The staff was incredibly friendly & nice, but my favorite part about this hotel was how eco-friendly it was. You can read more about that on their website, but I will say that I just loved supporting a resort that was both luxurious and ecologically responsible. The hotel offered a yoga class facing the ocean that we totally took advantage of, and the property was beautiful and huge enough for us to explore when we weren't just relaxing on the shore. The food at the restaurant & beach club was delicious and the weather was sunny the rest of the time we were there so all we did was walk around and enjoy. There's no doubt about it that Tulum is absolutely beautiful, but something that was in the back of my mind the entire time I was there was how often I see photos/videos of it on social media these days. I didn't want to ask for any recommendations before I came here because I wanted to explore it for myself and it got me thinking - how much actual discovery is involved in travel blogging these days? I found myself recognizing a lot of the same hotels, spots, restaurants I see in photos online and I often I had to stop myself and think: Do I want to try this/go there/photograph or film this because I like it/want to try it/want to share it or because this is what's popular on social media/where everyone else goes? Often I see these MUST-SEE recommendations online and am grateful of course, but at what point does a particular recommendation become so recommended that it's lost its specialness and turned into a tourist spot/something just for the 'gram? Social media aside, when it came down to it, this trip was probably the most laid back I'd ever been on a trip. All we did was eat, swim & sleep - and I honestly couldn't have asked for more. Sure, I took photos/videos and scoured my feed for places to check out, but I really kept the word VACATION in my mind the entire time I was here. So yeah - Tulum is totally Instagrammable and there's no shortage of hotels, restaurants or things to do. However, the reason I'd recommend going here is that it's an incredible place to just put your feet up and enjoy doing absolutely nothing but live.